She had tried twice before in 2017, but Camille Herron still hadn’t finished a 100-mile race until Saturday. She not only placed first at the Tunnel Hill 100, but also set a world record in the process. Finishing in 12:42:39, averaging 4:45 per kilometre, Herron, 35, crossed the finish line before any of her male competitors at the Vienna, Illinois, race. She also set the fastest known time for men and women on the USA Track & Field-certified course. The previous 100-mile women’s world record belonged to Gina Slaby and was set at the 2016 Desert Solstice track race in 13:45:49. As for fuelling, Herron dutifully ingested two gels per hour and sipped on her sports drink throughout the race. But after so many hours of sugar, she decided to get creative during the last 32 kilometres. “I drank a beer and a half and it helped settle my gut,” she said. “I think you gotta treat yourself at some point.” It was less than two weeks ago that Herron decided to run Tunnel Hill. 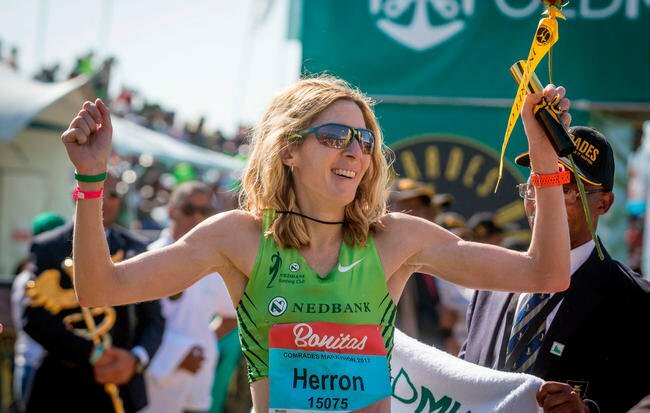 Herron, who lives in Oklahoma City and works part-time as a research assistant in osteoimmunology at the University of Oklahoma, won the 2017 Comrades Marathon in June. She originally set a goal to also win the Western States Endurance Run just days after Comrades to become the first woman to claim the double victory since ultrarunning legend Ann Trason did so in 1997. Unfortunately, Herron was forced to drop out. She went for another 100-mile finish at the Leadville Trail 100 later in the summer but suffered a hip injury about 64 kilometres into the race. The Tunnel Hill event was her last-ditch effort to conquer the distance before the year was up. What’s next for the ultrarunner, who also holds the Guinness World Record for the fastest marathon dressed as a superhero (2:48:51 as Spider Man at the 2012 Route 66 Marathon)? More record attempts at the ultra distances – and a dedication to having a good time while doing so.